The Canadian government long ago joined this war on Iraq: for the past 12 years the Canadian Navy has been enforcing a senseless and cruel economic war on the civilians of Iraq which has cost more than one million lives. Over thirteen million people demonstrated worldwide in over 800 cities, including hundreds of thousands throughout Canada in freezing temperatures, against the invasion of Iraq – the largest protest in human history. It demonstrated in the most graphic terms what the people of the world have been saying, that these wars are not in their name and that another world without war is possible. It placed at the centre of the political life of this movement and of the country the demand for an end to pro-war government and for an anti-war government. 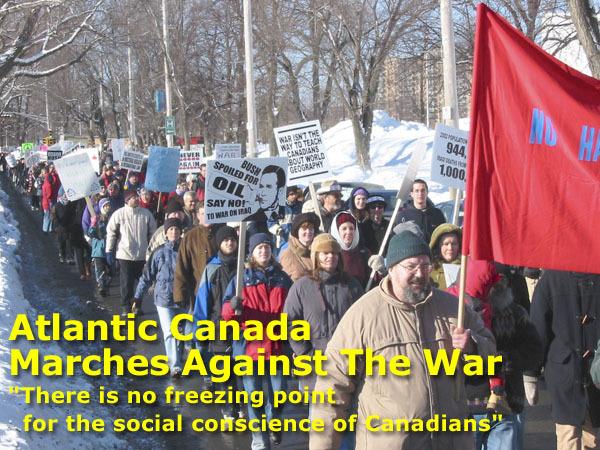 THROUGHOUT ATLANTIC CANADA, thousands of people marched on February 15 declaring loudly in one community after another – fifteen in all – No to Bush’s war and any Canadian involvement. Workers, women, seniors, youth and students, political personalities, trade union representatives, political and social activists and people from all walks of life including many families and children, poured into the streets as part of the Global Day of Action involving millions of people worldwide against the war of aggression the U.S. is planning against Iraq. Canadian troops being trained for invasion of Iraq? (FREDERICTON, February 15, 2003) — The organization F.R.E.E.D.O.M., New Brunswick* reports that in December, the 2nd Battalion of the Royal Canadian Regiment (2RCR – mechanized infantry) engaged in the largest live-ammunition combat exercise ever undertaken in Canada since the heart of the cold war at CFB Gagetown – half an hour south of Fredericton. (HALIFAX, 13 February 2003) – HOW CAN WE shut our eyes to the grim reality unfolding in front of us? Preparation for war are “crimes against the peace,” according to the Charter of the United Nations and the Nuremburg Trials. No to US military training and refuelling in PEI! (CHARLOTTETOWN, 13 February 2003) — Representatives of a Canadian corporation were in St. Joseph, Missouri in mid-January for the 22nd annual Air Mobility Tactics Symposium, at Rosecrans Air Force Base, according to Earth Action. 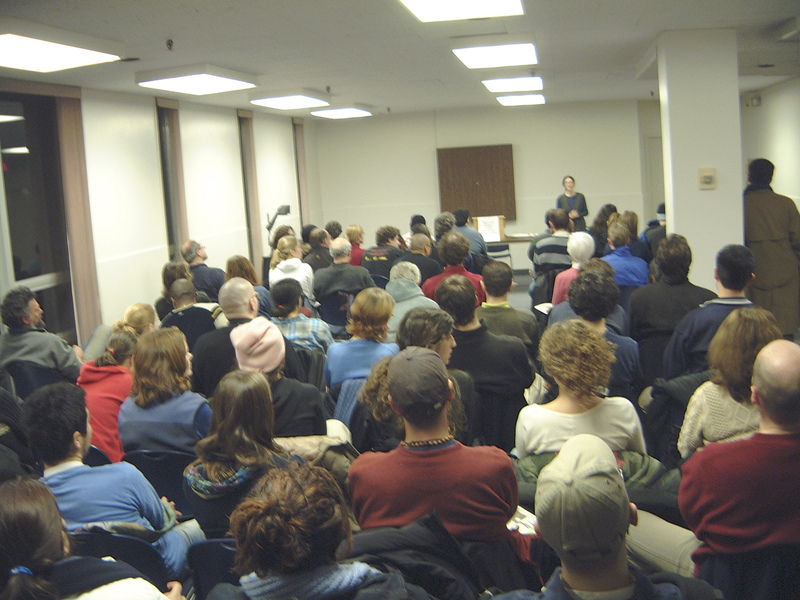 This essay is the text of the paper “Why Iraq?” given on January 29, 2003 to inaugurate the Halifax Political Forums held at Dalhousie University from January to May on the theme “Peace & Nations in the 21st Century: Understanding the Causes of War.” One hundred and three people attended, filling the lecture room to overflowing.